Formed in 1981, Dead Can Dance were one of the flagship bands for seminal record label 4AD, a label that made a huge contribution to the independent music scene throughout the eighties and nineties. Home to such influential artists as the Cocteau Twins, Pixies, Throwing Muses and the Breeders, 4AD quickly acquired a reputation for being a record company with a certain classy distinctiveness; the visually striking album sleeve artwork of in-house designer Vaughan Oliver and their commitment to the ideal that a record was something more than a piece of vinyl set them apart from the crowd. 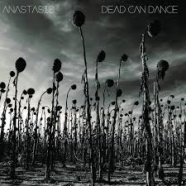 Dead Can Dance fitted in perfectly with the 4AD aesthetic. Their early work was strikingly unique –singer Lisa Gerrard’s shrieking banshee wail set against a backdrop of mysterious, ethereal quasi-Goth complimented the emerging 4AD identity at the time. Anastasis is very much their comeback album –their first since Dreamchaser in 1996 and their subsequent split in 1998. Their sound has evolved since those early 4AD releases – gone are the more glaring Goth leanings to be replaced by a more exotic, lushly produced tour of World Music, drawing on Greek, Egyptian & Middle Eastern influences. ‘Anabasis’ is all snaking Egyptian mysticism but whether you will like this album or not, really hinges on one thing –can you buy into the New Age melodrama that permeates every single note of this record. If that is your thing, than you will find much here to delight –Lisa Gerard is still a very fine vocalist and the whole package is beautifully produced. For some though, Anastasis may just represent a triumph of style over substance, a record that is hard to warm to and difficult to fall in love with.